Add the lengths of the sides to determine the perimeter of the polygons on these worksheets. Find the perimeter of each shape by counting the centimeters along the edges. Add the lengths of the sides of each shape to find the perimeters. Measure the lengths of the sides of the corn field, the pigs' pen, and the cows' field. Add the sides to find the perimeter. Game: Perimeter "I have/Who has"
Play this whole-class card game to review perimeter. Each student must calculate the perimeter on his card and read it aloud on his turn. Scoot! is a game in which students move around to each desk in the classroom while finding the perimeter of polygons. Basic introduction to perimeter. Students add the sides of the polygons. Recommended for grades 3 and up. Use addition to the find the polygon perimeters. Determine the lengths of the missing sides, then calculate the perimeter. Grades 4 and up. 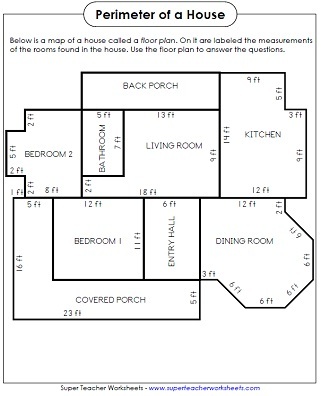 Read the floor plan to find the perimeter of each room in the house. Find the perimeter by adding the length of the sides of each polygon. This worksheet has larger numbers than the worksheet above and not all sides are labeled. Recommended for grades 4 and up. Count the lengths of the sides to determine the perimeter of each shape. 4th grade and higher. Add the sides of the polygons to find the perimeters. Includes decimals and fractions. 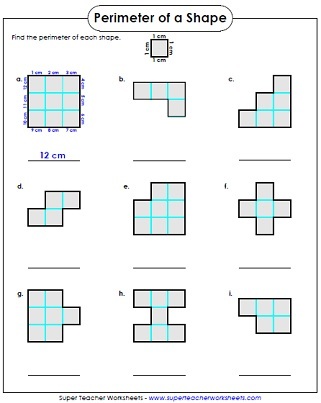 Find the perimeter of each shape. Some polygons have sides with unknown lengths that students must calculate. Includes whole numbers, fractions, and decimals. Students use their knowledge of symmetry to find the perimeter of each figure shown. Count the square centimeters to find the area and the perimeter of the shapes. Add and multiply to find the perimeters and areas of these rectangles. Determine the perimeter and the area of each rectangle shown. Pupils determine the circumference, or distance around, each circle using the illustration and diameter. Just like above, students must find the circumference, but this time only the radius is given. The given radius or diameter can help students figure out the correct circumference for each circular shape. 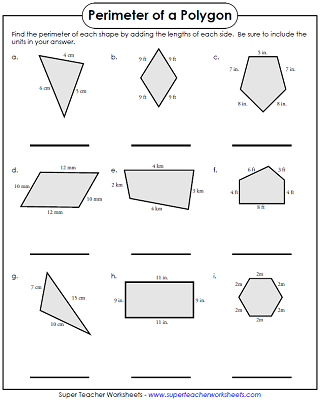 Worksheets in which students calculate the area of the given shapes. All types of geometry skills, including polygons, lines, angles, symmetry, congruent shapes, and more. Circumference and area of a circle, as well as a basic introduction to radius and diameter.